Baboons have many endearing characteristics and provide endless entertainment on game drives in Africa but in the Okavango Delta in Botswana the baboons have developed some interesting habits to adapt to the unique waterway. 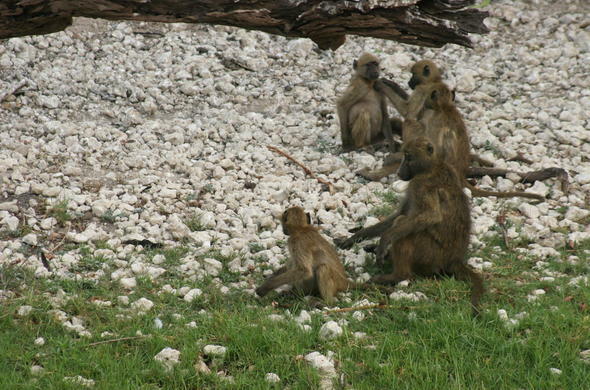 Watching baboons carry on a normal daily routine is eerily similar to watching humans go about their daily lives. 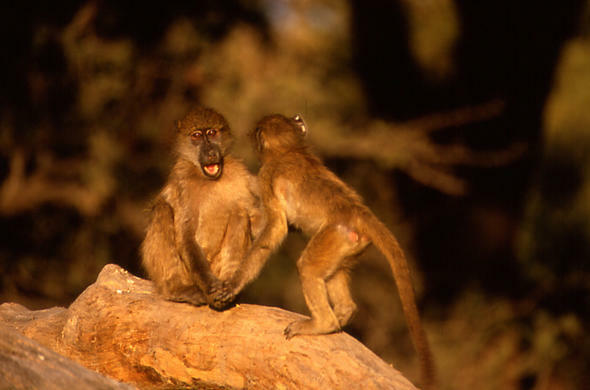 Being amused at the behaviour of baboons is in some ways a reflection of us laughing at ourselves without having to show ourselves up to each other. 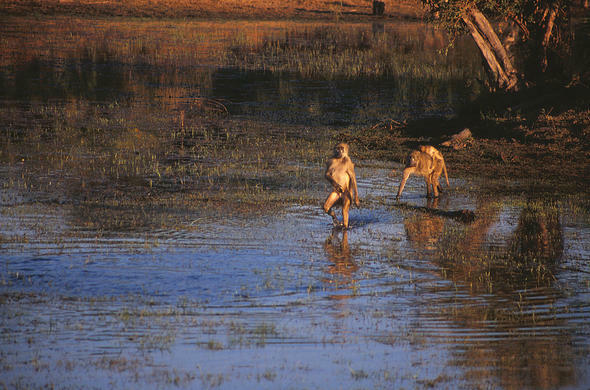 The baboons of the Okavango Delta show unique behavioural patterns in their activities, with probably the most revealing part of their behaviour showing up when they have to cross water. The channels of the delta vary in depth and it is here where a belief in evolution is enhanced. Even within the same troop individuals will have their own ways of crossing a channel. 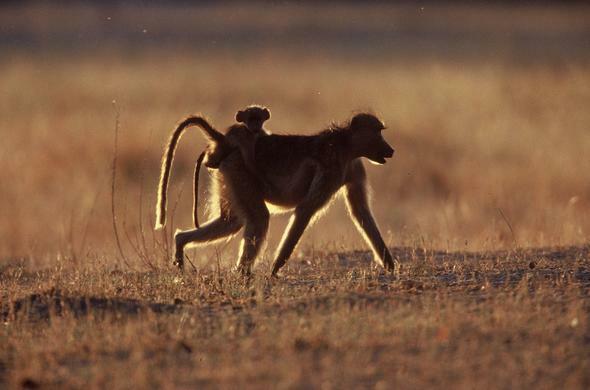 Mothers with babies will generally splash through on all fours, dunking the screaming baby in the process whilst other members of the troop will walk on their hind legs - with various styles being exhibited. There are those that barely hesitate when reaching a body of water - they simply head on through and there are those that walk to and fro along the edge of the water, hesitant to cross, even when most the others have gone through, eventually taken the plunge amid high-pitched screaming and panic. The ilala palm trees in the Okavango Delta provide the animals with food in the form of the palm fruits that grow in the tops of the trees. Elephants will simply use force to shake the palm trees, feeding on the fruits that fall and baboons climb to the top of the trees to feed on the fruits - a practice that is often cause for concern. 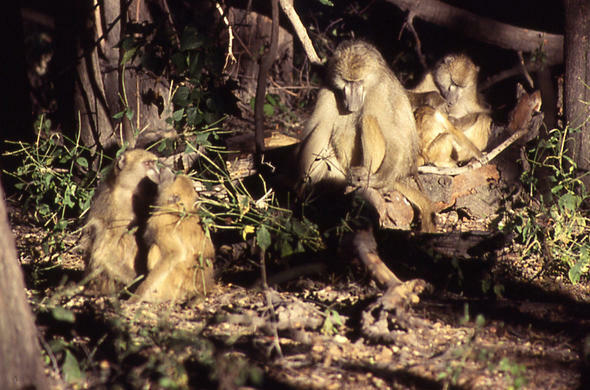 Personal observations on two occasions showed baboons feeding in the tops of 20m high palms when elephants approached the palm grove. Usually baboons would not react at all to elephants coming close but on the first occasion one baboon looked up and saw the approaching elephant when it was about ten meters from the palms. The baboon let out a bloodcurdling scream and jumped from the top of the palm tree to the ground and ran off. The other baboons in the palms, reacting to the warning, saw the elephant and pandemonium set in. Some jumped the 20m to the ground while others scrambled down the stems of the palms in squealing fear. 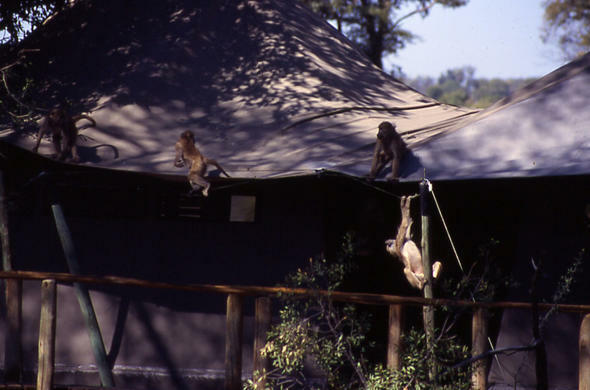 On the second occasion the baboons saw the elephants from some distance off and they quickly clambered down the palms and disappeared. My deductions from these observations are that baboons know instinctively that elephants feed on palm fruits by shaking the trees and panic sets in when they see elephants approaching.